Ah, Holey Cheeses! « John Bartram Lives! This week we enter the season of Lent. Again. There will be riotous celebrations in honor of the French Mardi Gras. To truly celebrate Fat Tuesday one must believe in the sacredness of Ash Wednesday. One must believe that several miracles occurred to have the man we call Jesus be born of the Virgin and become quick and risen from the dead after his crucifixion on Easter Sunday. I have been disowned by the Quaker Friends Meeting in Darby because I deny the miracles of Christmas and Easter. I deny Christ’s divinity. There is one God. And that God is singular–not triune. And God truly knows what he is about when he allows mortal souls to sample and savor His holey cheeses. This week God revealed a true apotheosis to me. His creation of cheese is revelatory. I now regard Wisconsin as a state of pilgrimage. It is no less a shrine to divinity than the Catholics view Lourdes, the Protestants appreciate Wittenberg, followers of Islam register Mecca, and aging Rock-and-Roll fans visit Graceland. 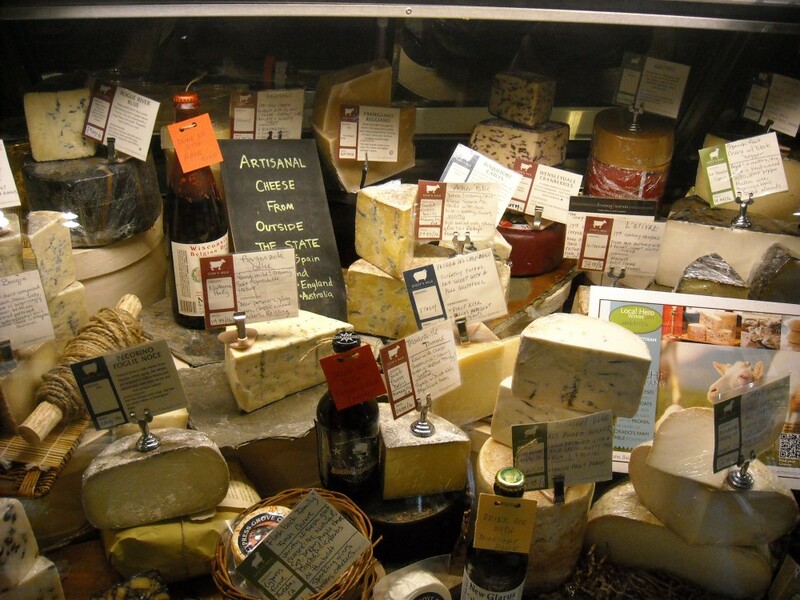 All of the cheeses are fresh-from-the-farm and taste of the grass on which the animals feed. Many are not pasteurized. Most are not homogenized. 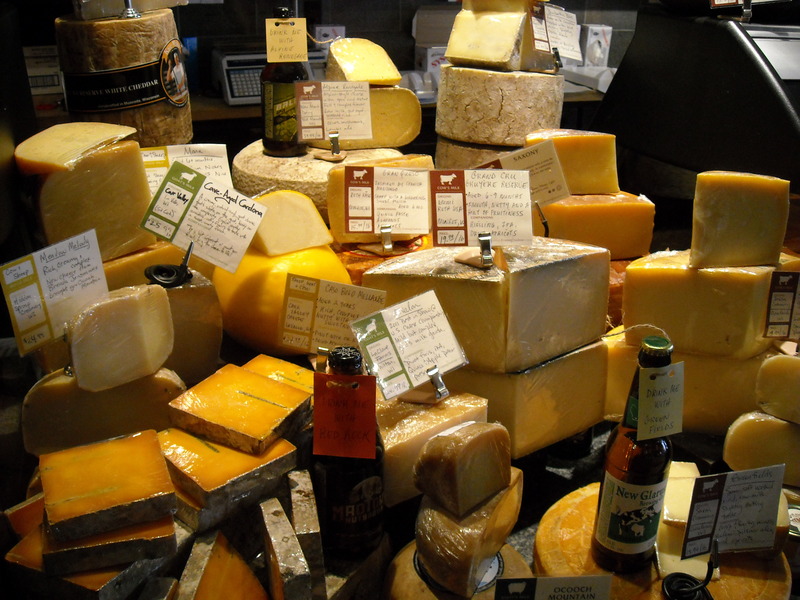 It’s the timing of any cheese older than 60 days that allows it to be germ-free and safe for consumption. Most of the cheeses that I sampled were considerably older. And I sampled an incredible variety. God doesn’t provide just cheese alone. He also provides artisanal crackers, condiments, and complements like teas, savouries, and chocolates. I did a lot of fiscal damage avec fromage. In addition to cheese, Fromagination also has a full selection of condiments, crispy crackers, and complements. But the best is reserved by the staff and they speak eloquently about the curing and the caring. It’s the holes that create the sparkle. Cheeses exude a liquor that collects in the holes. This liquid condenses and evaporates, leaving behind a crystalline salt. The crunch found in many of the most mature are these crystals bursting as they are bitten in the soft creamy matrix. Ah! Holey Cheeses. Some of the staff recommendations that I brought home include: Bleu Mont Dairy Reserve Bandaged Cheddar http://www.eatwisconsincheese.com/wisconsin/artisans/Results.aspx?artisan=7, Buttermilk Blue Roth Kase http://www.emmirothusa.com/?id=1672, Pleasant Ridge Reserve Uplands Cheesehttp://www.uplandscheese.com/, Chalet Cheese Swiss Wheel Aged http://www.eatwisconsincheese.com/wisconsin/artisans/Results.aspx?artisan=16 , andAlpine Renegade. It was a fattening experience. But that’s what Mardi Gras is all about. Since my return from this travel experience, my wife agreed that we needed to share our bounty and host a cheese tasting. We will have a dinner and it will, most assuredly, be a wholly holey religious experience. Mr. Bartram never cheeses (oops – ceases!) to amaze me. Not just every husband brings cheese home from a business trip! And they are very tasty!